Will CMS Double Down on the Success of the Recovery Audit Program? 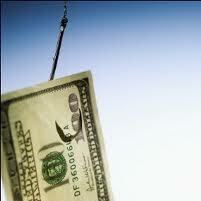 According to CMS, between October 2010 and December 2012, the RACs collected $3.8 billion in overpayments. As the nearby chart makes clear , the volume of amount collected each quarter has continued to increase, the result of the ever increasing number of issues approved for review by CMS as well as the RAC’s increasing expertise in discovering alleged improper payments. There is little doubt that CMS considers the Recovery Audit Program to be a financial success or that it will continue to expand. The Change to the Time in Which CMS Can Collect an Overpayment. 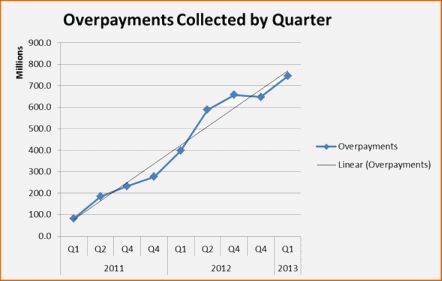 In May 2012, the HHS-OIG released a report entitled “Obstacles to Collection of Millions in Medicare Overpayments” detailing its findings on how well CMS and its contractors were doing in collecting previously identified overpayments. In response to the OIG’s contention that CMS was not doing a good enough job collecting identified overpayments, CMS claimed that part of the problem was that its collection activities were hampered by the limitation in 42 U.S.C. § 1395gg which restricted recoveries of overpayments from providers to those overpayments made within the last 3 years, even though 42 C.F.R. § 405.980(b) permits a CMS contractor to reopen a paid claim for any reason within 1 year of the date of the initial determination and within four (4) years of the date of the initial determination if there is good cause. The OIG report recommended that CMS ask Congress to change the recovery period in § 1395gg to a period greater than the reopening period set forth in § 405.980. In § 638 of the recently enacted American Taxpayer Relief Act of 2012, the law passed to avoid the “fiscal cliff,” Congress responded to the OIG recommendation by changing the recovery period in § 1395gg from 3 to 5 years, 1 year longer than the reopening period in § 405.980. The Recovery Auditor shall not attempt to identify any overpayment or underpayment more than 3 years past the date of the initial determination made on the claim. When CMS issued the final SOW in 2011, it presumably limited the RAC lookback to 3 years because of the 3 year limitation in § 1395gg. With that limitation now changed to 5 years, the question arises as to whether CMS will amend the SOW to permit the RACs to identify and reopen claims where the initial determination was made up to 4 years earlier. There is little reason to believe that CMS will pass up the opportunity to expand the universe of claims subject to RAC review. Since the contingent fee structure of the RAC program makes it self-funding, expanding the universe of claims subject to RAC review will not result in any significant additional costs to CMS. Further, expanding the claim universe does not force the RACs to incur additional expense, but gives them the opportunity to substantially increase their profit. I believe that the recent amendment of § 1395gg creates a classic win-win situation for CMS and the RACs, but foretells a significantly less positive and more expensive future for providers. Please contact us if we can be of any assistance with the activities of the Medicare Recovery Audit Contractors or in helping to resolve an issue with any of the legion of other auditors working for CMS.